“Neighbors Helping Neighbors.” Yes, this area is especially blessed with volunteers and financial donors who support various factions of our community. All of us who live here can be proud of that. One of those groups includes the veterans who have sacrificed to keep us free. Yes, we pay proper tribute to them on patriotic holidays, but some do more than that. 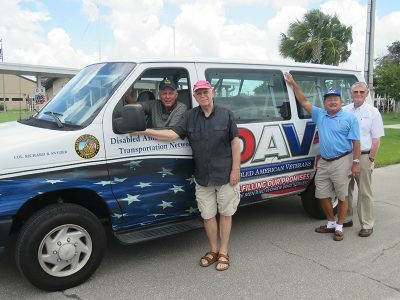 Those who keep the Disabled American Veterans (DAV) transport service alive are certainly among those unsung heroes. They are small in numbers but gigantic in dedication. If you are not an early riser, you won’t see the six-seat DAV van leaving the S.R. 674 fire station each weekday morning around 6:30 a.m. Veterans with medical appointments at James A. Haley Veterans Hospital in Tampa or one of its satellite clinics can “catch” the van at one of five stops: N. Pebble Beach Boulevard (just north of the Sun City Center Library), Sun Towers, Kings Point, Ruskin Post Office and Gibsonton Walmart. Not widely known is the fact that the service is actually a Veterans Administration program, sponsored and managed locally by DAV Chapter 110. This group just completed its tenth year of sponsoring the program. Darrell Katz, adjutant for DAV Chapter 110, credits Stuart and Kathy Swayze for survival of the local service. “Last year we were on the verge of suspending the program due to the lack of dispatchers and drivers. Stu and Kathy saw our call for volunteers and quickly set about building a team to save the program. They both have extensive managerial experience, which they use daily to coordinate the team’s activity. Since this is a government program, there are mounds of paperwork to report riders, mileage, time, gas usage and vehicle maintenance, etc. The Swayzes handle all that; we are truly indebted to them,” he said. The only requirements for ridership are that the veteran is a patient at Haley, is ambulatory (no wheelchairs) and has called 813-642-0302 to reserve a seat. They request at least three days notice, but will do all they can to accommodate last-minute requests. Average ridership is about 65 a month. There is no residency requirement, but most riders live in South Hillsborough County. The local DAV chapter operates from an office at 1002 Cherry Hills Drive where they help veterans with VA issues such as applying for VA benefits, requesting re-evaluations of current status and applying for surviving spousal benefits, etc. The SCC Community Association began providing the space at no charge in 2015. Veterans/spouses do not have to be a DAV chapter member to request help. Nor do they have to be residents of the Greater Sun City Center Area. For information or to schedule appointments with the adjutant, call 813-642-2047.